The voting is done. The shortlist is ready, the winners will be announced on Friday 21 February from 8pm at the gala fundraiser for IHRC in Wembley, London, UK. If you want to attend the awards ceremony which includes a gala dinner and fundraising auction please buy your tickets on-line here or call the office on 02089044222 to buy over the phone. There are still afew tickets left, so join us on the night to rewardthose who have struggled against Islamophobia and to name and shame the worst Islamophobes. If you want to attend the awards ceremony which includes a gala dinner and fundraising auction please buy your tickets on-line here or call the office on 02089044222 to buy over the phone. Full details of the programme, and a chance to see the auction items can be found inside. Watch the trailer for this year’s awards here. I am delighted to send this message of welcome for the Islamophobia Awards Ceremony and for the valuable work of the Islamic Human Rights Commission, and I am proud to have been involved in some of their work. I love the tone of this event as it takes an issue that has at its heart darkness and seeks to make it lighter on our community. After all so much of the nonsense written about Islam and Muslims goes beyond sadness and into parody. 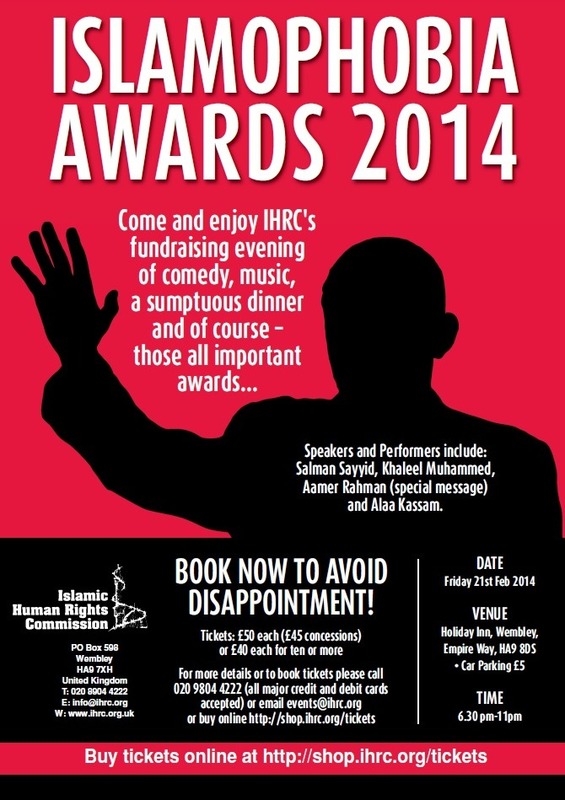 Well done IHRC for your sterling work. My vote goes to Bibi Netanyahu for his Outstanding Effort to demonise Islam. 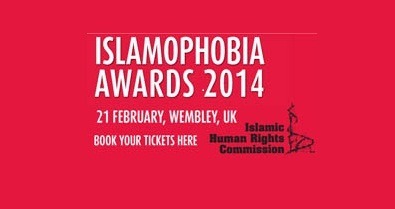 I am sorry I cannot attend the Islamophobia Awards 2014, and wait with bated breath to see who this year’s worthy – or should that be unworthy? – winners are. It is not often that one expresses one’s support for an event by wishing that it should soon go out of business for lack of suitable nominees, but that is, indeed my wish for the event. But whilst there continues to be such a plentiful supply of scurrilous potential nominees, I wish the event every success and I hope you all have an enjoyable evening. I am sorry I cannot be here, but it is my pleasure to write in support of this year’s Islamophobia Awards and the valuable work of the Islamic Human Rights Commission. It is important to work together within a variety of fora to counter discrimination targeted at the Muslim community. I wish the Islamophobia Awards every success in highlighting such prejudice. The work that the IHRC is doing in relation to the problem of Islamophobia is among the most important in the world today. The IHRC is not only involved in concrete campaigns against Islamophobia but is also doing cutting edge empirical social science research about Islamophobia in Europe and the world at large. They are doing what academic institutes and universities should be doing. However, in the absent of a real commitment from universities and state institutions to tackle research and public policy on discrimination against Muslims, the IHRC has taken the lead to confront Islamophobia at the level of politics, policy and knowledge production. No other institution in the world today has dedicated more attention to Islamophobia than the IHRC. The quality and quantity of their research publications on the topic are impressive! They deserve to be recognised as one of the world’s leading institutions working to eradicate Islamophobia. The work IHRC is doing constitutes a model that we should all be following. The fact that prejudice and ignorance are ridiculous doesn’t – unfortunately – make them less lethal. But it is important from time to time to be reminded that they are ridiculous, and that’s why this event is so welcome. Some theologians have contrasted the light-heartedness of heaven with the fact that the devil and his angels take themselves with deadly seriousness, even when engaged in the most absurd project possible, resisting the all-powerful goodness of God. I hope this evening will make some contribution to delivering us from deadly seriousness and recall us to the joy that faith opens for us. I’m really pleased to see the Islamophobia Awards returning this year for what I know will be a very fun evening with a serious message. Discrimination and prejudice in all their forms are completely unacceptable but, sadly, they persist. With the current climate of anti-immigration rhetoric in the media, I am particularly concerned about rising xenophobia and Islamophobia. That’s why the work of the Islamic Human Rights Commission is so important. Operating to the highest standards over the years, the Islamic Human Rights Commission continues to remain active and serious in its work. Through its activities, the IHRC has evolved to become an important voice which brings to our attention key facts and figures in serious and informative research, ensuring that we, the public, are kept accurately informed in a consistent and academic way. I am very supportive of their work and their truly valuable contribution. At a time when Islamophobia is on the rise and when secular tensions seem to be mounting globally, the Islamic Human Rights Commission (IHRC) is doing vital work to try to build bridges between communities here at home in the UK, and abroad. The regular exhibitions, talks and book launches held at the IHRC bookshop brings members of the local community together and provides a platform for otherwise seemingly taboo and potentially controversial subjects to be spoken about openly. The IHRC also reach out to support local charitable initiatives and recently supported a volunteer run soup kitchen called the Children of Adam by providing 100 free hot meals for the homeless. These sorts of charitable outreach efforts are vital in terms of helping to tackle Islamophobia, promoting community cohesion, and putting into practice the charitable teachings enshrined in Islam. The IHRC does not shy away from tackling the larger issues that many other groups are too scared to discuss. They openly promote concepts like Genocide Memorial Day; they are at the forefront of many events supporting the oppressed people of Palestine; they challenge the continued and unjustifiable existence of places like Guantanamo Bay, and otherwise speak up for those with marginalised voices as well as those with no voice at all. challenge each other’s beliefs and thought processes without fear of recourse to recrimination. The provision of that space and service is one of the key strengths of the IHRC. As with previous years the nominations for each category come from all over the world and anyone can nominate. Nominated are the haters par excellence, the Islamophobes who go that little bit further… You can nominate individuals or organisations, from any walk of life from journalists to politicians, authors to think tanks and more. The names of shortlisted nominees will be available from Wednesday 19 February. Watch a Channel 4 News report on the first Awards here. Photos of some of the previous years events below. Download the poster from the end of the page and share.